Following the success of preceding years, Manick Sorcar's artwork in various media will be held again on September 25 and 26, 2010, 10 AM to 6 PM at his 2,500 s.f. studio at 14565 West 58th Place, Arvada, CO 80004. It will be a part of the 9th Annual - 2010 Arvada Art Studio Tour. "It will reflect many of the heart-warming experience I left behind in India, and I miss them" said Manick of the artshow theme. A total of forty five selected art of his will be displayed. The show is open to public. 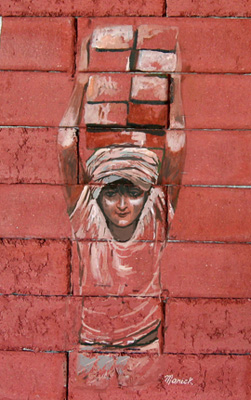 "Brick on brick" : An acrylic painting of a child carrying bricks, on slices of real bricks.
."The inspiration came from a construction site in Calcutta, near my home", said Manick. "At first I was sad. But soon I realized the child was working out of necessity to supplement earning for the family. He told me he was going to school at night. Dusts from bricks were all over his body, but they couldn't cover the faint smile on his face". The visitors will get a glimpse of Sorcar's wide variety of artwork ranging from facial expressions of India's people in warercolor, acrylic paint to contemporary art painted in digital media, news-art, tile collages, tile paintings and sculptures of Indian icons, portraits of Hindu Gods and Goddesses with spices and grains, etc. "World of Manick Sorcar Where Art Becomes Magic", by Roma Sur. Foreword by Patrick Murphy, the Executive Director of International laser Display Association, $45. A popular book on Manick's art (a hot seller online at amazon.com and best seller in non-fiction category at the Tattered Cover Book Store). "East Meets West: The Animation of Manck Sorcar", by Wendy Luna. Foreword by John W. Hickenlooper, the Honorable Mayor of Denver, Colorado. $27. A thoroughly researched, recently-released book on Manick Sorcar's award-winning animations, written by the same person whose research paper for a BFA degree in college was the roots of this.